Yesterday’s dinnerFeed featured Arctic Char with a Pistachio Crust, a savory recipe from a recent dinner party I attended. 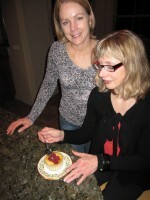 The host, Donna Newsom, concluded her masterful meal with a heavenly custard, the perfect dessert to bring in the New Year. Donna used Michigan creamery’s Guernsey eggnog, insistent that “these little gems” would not be as wonderful if a cook used anything less than an exceptional eggnog. We enjoyed the custard warm but Donna said it was equally good chilled. If you like easy make-aheads, this is the perfect recipe as it can be made 24 hours in advance. Simply garnish with fruit before serving. Spooning up this creamy, festive eggnog custard was the perfect antidote to an evening of wonderful food, champagne and camaraderie. A rousing round of Auld Lang Syne topped off a memorable evening bringing our troop full circle into the New Year. In large bowl whisk together eggnog, eggs, sugar, vanilla & rum. Fill 6 small souffle dishes with custard and place in a lasagna or cake pan. Dust the top of each custard with pinch of nutmeg. Pour hot water into pan creating a bain-marie (hot water bath for custards to bake in). Fill pan just to cover half the height of your selected custard dishes. .
Place custards in preheated oven for 30-40 minutes. 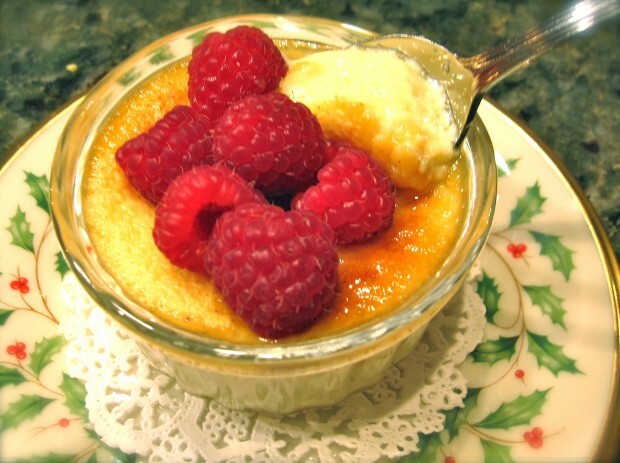 Test by inserting a butter knife near the edge of the custard; when knife comes out clean and they are still slightly jiggly in the center, remove from oven. Cool custard in water bath; they will continue cooking to the desired creamy consistency. Serve warm, room temperature or chilled with raspberry garnish.